Samuel Johnson (born Lichfield, Staffordshire, England 18 September 1709; died London 13 December 1784) was a famous writer. After publishing a famous dictionary, he was given a doctorate, which is why he is often called "Dr Johnson". He wrote some of his own stories, but more often he wrote criticisms about what other people had written. He said a lot of witty, amusing things, which are still remembered today. We know about some of the funny things he said because his friend James Boswell wrote a book about him. 3 Johnson's "Dictionary of the English Language"
Samuel Johnson was born in Lichfield, Staffordshire. His father had a bookshop, but he was very poor. Samuel went to school in Lichfield. When he was nineteen he went to the University of Oxford, but he was so poor that he had to leave without taking a degree. A few years later he married a woman 21 years older than he was. They went to live in London, where he tried to make a living by writing but for many years he was very poor. It was not until 1762 that he became famous and the government gave him a pension of three hundred pounds a year. 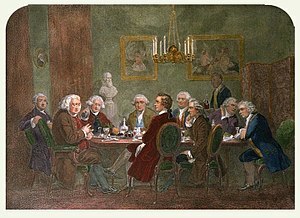 He started a club (called "The Club") which included a lot of famous people like the painter Joshua Reynolds and the writer Oliver Goldsmith (see picture). Johnson was now so famous that he was given an honorary doctorate (the title of "Doctor") from Trinity College, Dublin in 1765, and an honorary doctorate from the University of Oxford in 1775. Boswell and Johnson spent some time in Edinburgh and they travelled a lot to the Scottish islands. Johnson died in 1784 and is buried in Westminster Abbey. Johnson spent several years writing his Dictionary of the English language. It was a big job. While he was writing it he could not be earning money, so he needed a patron (someone who would sponsor him by giving him money, and in return the dictionary would be dedicated to him). An important man called Lord Chesterfield said to Johnson that he would be his patron. But he never gave him any money, and Johnson never heard anything more from him, until the dictionary was ready. Then Lord Chesterfield wrote to Johnson saying that he hoped he would dedicate the dictionary to him. The letter that Johnson wrote back to Lord Chesterfield is very famous. It is very sarcastic (funny in an unkind way). Johnson said to him that it would have been nice to have had help when he was needing it. He said, sarcastically, that a patron was someone who stands on the river bank watching a man drowning and then, when then the drowning man is saved, asks him whether he can help. The letter made Lord Chesterfield look very silly. There were very few dictionaries in Johnson's day, so it was a lot of work for him. Nowadays, a dictionary is made by a team of people. Dictionaries, like encyclopedias, should just give facts. But Johnson sometimes explained words in his dictionary in a way that showed his opinions (what he thought about things). In most dictionaries, "oats" is said to mean something like: "a kind of cereal used as food". But Johnson (who hated the Scots) wrote: "a food given in England to horses and in Scotland to men". In most dictionaries, "opera" is said to mean something like: "a play which is sung to music". But Johnson (who did not like opera) wrote: "an exotic and irrational entertainment" (meaning something like: "entertainment from a foreign country that does not make sense"). Although it shows his personal likes and dislikes, the dictionary still deserves to be famous. Johnson defined 43,000 words. It was the first time a dictionary had been published that gave examples of how the words had been used by well-known writers. This page was last changed on 18 September 2017, at 06:14.